Summary: Now you can draw directly on the touch screen of your PDA. No more sheets of paper and pencils. Now you can draw directly on the touch screen of your PDA. No more sheets of paper and pencils. Using this program you can draw lines, shapes, text, erase and copy fragments, and zoom your drawings. You can use one of 16 millions of colors. PDAcraft Paint is a drawing tool you can use to create simple drawings. 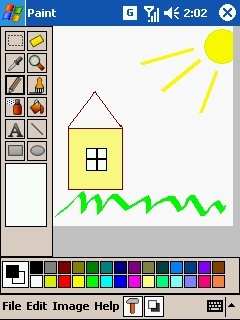 This program is similar to well-known desktop program Paint. Unlike desktop version, PDA version is more comfortable, because you can draw directly on touch screen with stylus. You can use Paint to work with pictures in .bmp format. The software was cool up until i saved the picture,didnt come out right,nice try tho (htc touch pro). I have some viz problems on my xperia, but thanks anyway! Follow the link directly to the developers site to download this, use the download option there because the one on this page just links you to ads. To get this to run on my HTC Touch I had to download the .cab file (the .zip file didn't work) on to my PC, with my HTC Touch connected to the PC's USB port, cut and paste the download on to my memory card in the Touch, and then run the .cab file once it's pasted on to the Touch memory card, where it goes through a proper install. 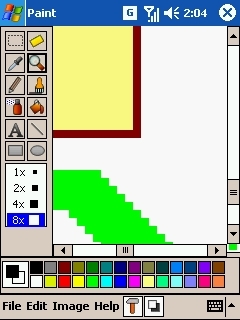 This program looks really good, I couldn't get a lot of the other ones to run on my HTC Touch, but this one is FREE and it's just like an old version of MS Paint, loads of options...I really like it!